I’ve had this problem in my other thread already, but it isn’t really related, so I moved it to a new thread. Whenever I try using a custom autograd.Function (i.e., a function that has an explicit backward pass defined), and I combine it with any torch.nn module, the backward pass is never properly executed. #   its backward pass is never executed. 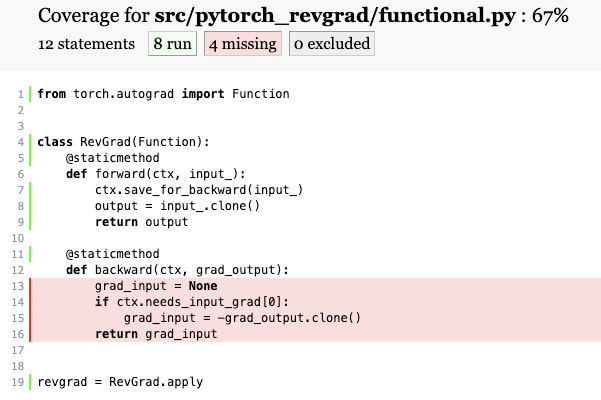 I am running the latest version of PyTorch (Anaconda says 0.2.0, py27hc03bea1_4cu80 [cuda80] soumith), with CUDA 8.0 and Python 2.7. With some PyTorch versions this seemed to have worked, but now it won’t anymore. Anybody knows what’s the matter, or else what I’m doing wrong? Thank you very much for any answers! EDIT: Silly me. I’ve been trying to solve this for quite some time, and literally 5 minutes after opening this thread I’ve discovered my mistake: I forgot to clone the inputs during the forward pass (code changed above), now it works. Sorry for the spamming; thread can be closed. Get error message "MaskedFill can't differentiate the mask"
If you don’t want to put the clone, you should mark that the input and output share some elements with the mark_shared_storage function like here. @albanD: thanks a lot for the additional input! I’m quite fine with cloning, for my variables are not immensely huge. @Akash_Goel: I’m obviously not an expert, but I assume the reason is the directed graph that is constructed behind the scene while running the forward pass on a variable. Every variable is linked to a predecessor and a successor. During the backward pass, this directed graph is traversed in inverted order. If one doesn’t clone the variable, its executor function is probably just overwritten, which leads to the skipping of one of the building blocks. By cloning, however, a new variable is appended that is assigned to the custom block, and this preserves the execution order. clone the input during the forward pass, and it still works. Interesting, but also confusing me! Had a similar problem. For me, mark_dirty worked perfectly. Makes backward getting called without needing to clone the input tensor or store pairs of tensors with mark_shared_storage. Does it really work for you? RuntimeError: a leaf Variable that requires grad has been used in an in-place operation. Is there any way to debug why my statcic backward method (much more complicated than the example above) is not called during backprop? Usually the issue has something to do with either a detach() call (which stops backpropagation) or returning the input unmodified in forward. Try returning input.clone() to see if it fixes the issue. I’m very confused by this - the gradients do get reversed, as is clear from the test succeeding. But somehow this happens without the backward call being made? Am I missing something fundamental here? I’m not sure how the coverage is checked, but if it checks if a python function calls the backward it will never happen. It is called directly by some cpp code. So the coverage tool might miss it. Thanks, that’s extremely helpful to know! I think that is the issue, as far as I know coverage.py uses sys.settrace to do this, so that explains things.